What blog service do you use? 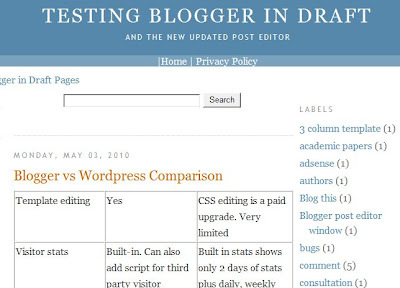 Windows Live Writer works with most popular blog services. Tell us which one you use. 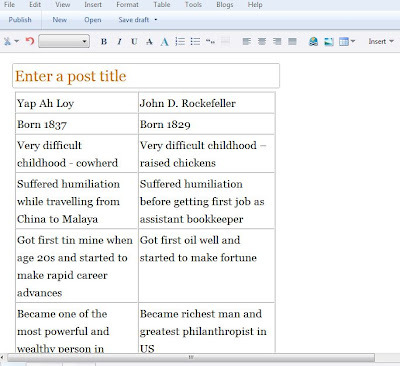 Loading Live Writer will immediately take you to Live Writer post editor. If you have more than 1 blog installed for Live Writer, go to the top corner and select the blog where you intend to publish the table. 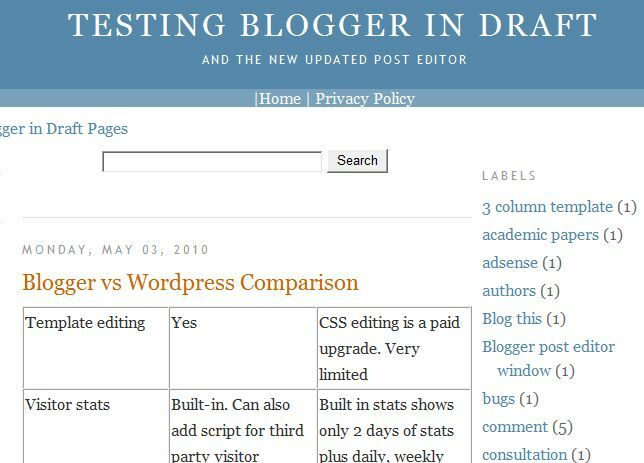 The reason is that if you had allowed Windows Live Writer access to your Blogger account and the themes (template) had been downloaded into Window Live Writer, you can click PREVIEW and see the post with the table as it would be when finally published. Following that, type in your choice for the number of rows and number of column and the table width and do not fret too much about your choice as you can later insert or delete rows and columns as you wish (right-click the last cell and select either INSERT ROW or INSERT COLUMN). Note that by being in the EDIT mode, you can drag-drop the border of the table to change the width of any column to your desired width (the width of the field [POST (for typing the post title)] can serve to guide you in what widths will make your table fit into the width of the main column. Don't click SOURCE unless you want to deal with the HTML table codes directly. Type in the content of the cells as you see it and add or delete empty rows/column if any. For content, you can even put in an image by typing in the HTML image tag like what I have done for the 2 images side by side above. Hi! Just to let you know, there's a table plug-in available through WLW Plug-ins that's a lot better than the standard table wizard. Nice post Peter, I like the way you've provided some detail about what it's like to actually use WLW. One thing I've picked up from reading is that once you've used WLW to write a post, you pretty much always need to use it to edit that post. It's something to do with some extra codes that WLW uses, which aren't supported by Blogger's editor. Hi! Just to let you know there's a table plug-in thats available from WLW plug-ins that's a lot better than the standard wizard. Larry, see I highlighted your comment over at Blogger for Dummies: Easily create tables with Windows Live Writer. Thanks for drawing our attention to the plugins. 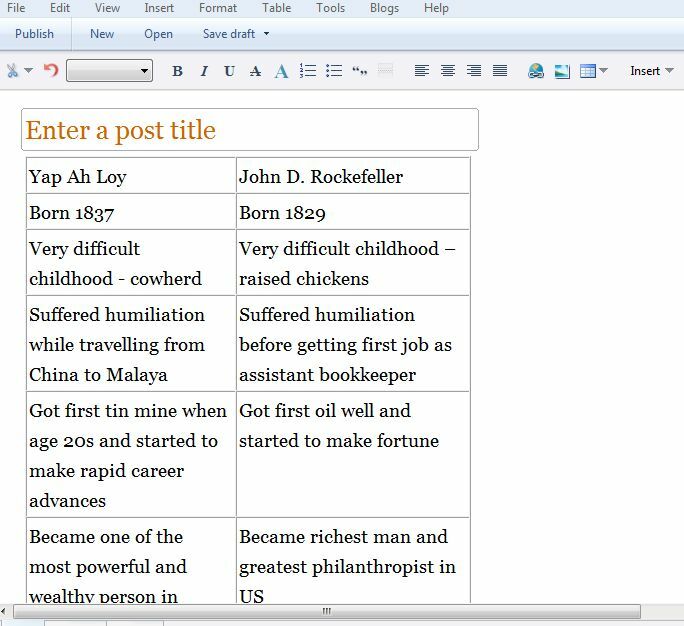 I find that many of the tricks and tips for using the web based blogger editor are just solved when you use Windows Live Writer. For example, putting two pictures next to each other is really easy in Writer. The only thing you really cannot do is create new pages in your blogger blog with it. Also I love the fact that I can blog off line. Thanks for updating us on the table plugin. Think I would search for it and try it out. Does the Google Live Writer work with a Mac? 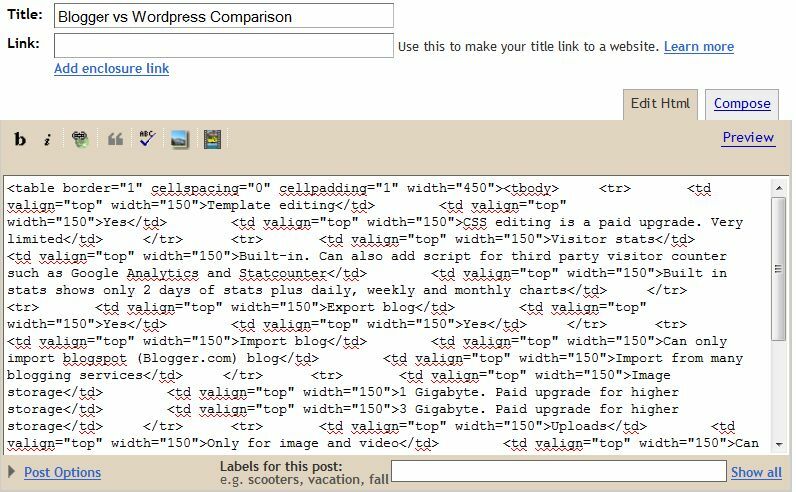 If not, is there a good solution for a table on Blogger when using a Mac. I would love to be able to insert a table or chart from Excel or Mac's iwork numbers. Any ideas? Thanks Peter. I will give Google Docs a look. It seems like it should work with Blogger, but I haven't used it enough to know. 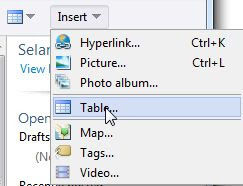 I do use Office for Mac and it works great for Excel, but I have not figured out a decent way to get a working table into Blogger. Google Docs Spreadsheet works well. After the doc is created, it is possible to make the chart/table and publish it in the blog. It is also interactive, if you so choose. When you update and save the spreadsheet, the chart/table will also update in the blog. I am still trying to figure out formatting. It doesn't quite fit like I would like, but I will play with it more and see what I can do with the formatting process. Check it out at twowheelstlouis.blogspot.com if you wish. @Abomb -- if you post the whole thing as a draft of a post, then copy all the code and paste into a blank page, you should be able to get around that. Thanks for the info - I've been doing this the hard way. Cryselle & Abomb, regarding posting to Blogger's static pages, I believe what Cryselle said about draft and "copy all the code" is referring to first writing (drafting) out the content (EDIT mode) then change to [source], copy all the codes and paste it into the Blogger PAGE post editor. I am having a hard time downloading windows live writer to my mac, is it even possible to do?